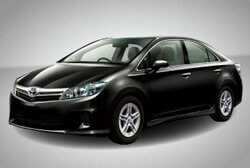 Toyotas are some of the most reliable and safest vehicles on the market. Their highest quality build is perfect for drivers of all ages, while boasting impressive performance quality. At Mark’s Independent Service in Chatsworth, CA, we provide the same professional repair and maintenance services of Toyota vehicles that you would expect from the Toyota dealership! Our ASE Certified Technicians are experienced and specially trained to provide top quality auto repair services on all Toyota models. We specialize in service and repair of Toyota vehicles and utilize state-of-the-art equipment and factory-level diagnostic tools, so we can assure you that your vehicle will be running it’s best when it leaves our auto repair shop in Chatsworth, CA. In addition, our auto repair services are guaranteed by our 2 year/24000 miles warranty! We want your vehicle to continue to be the reliable automobile you know and love. That’s why our friendly and knowledgeable team at Mark’s Independent Service is dedicated to providing thorough Toyota repair services! We’ll keep your vehicle running smoothly for many years to come.